Inspiration for my Holiday 2017 Collection comes from my summer trip to Portugal. The Dedham Square Artist Guild issued an artist challenge to the community. This exhibit is how 11 juried artists* met the challenge. Come to the reception to meet the artists and ask them about their work. All of the art in the show is for sale. The Challenge: “Identity” Who are you? Who are we? Who was that masked man? Let’s explore identity in all its forms, perceptions and definitions. Consider who you are, what you stand for, your roots. Discover how another person or group identifies himself/herself/themselves…through their culture, interests, history. 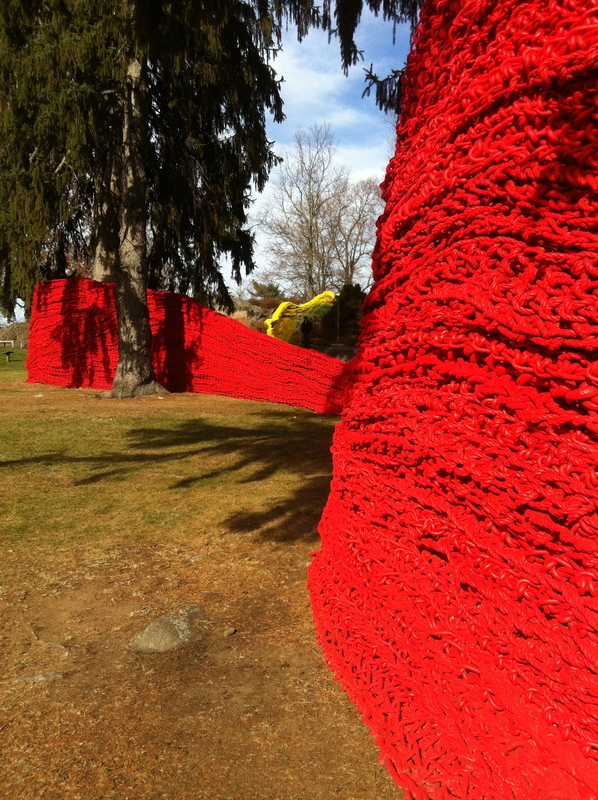 If you’ve never been to the deCordova Sculpture Park, put it on your list of things to do. My husband and I picked a beautiful day to explore the park. We wanted to see the newly installed “Red, Blue and Yellow’. 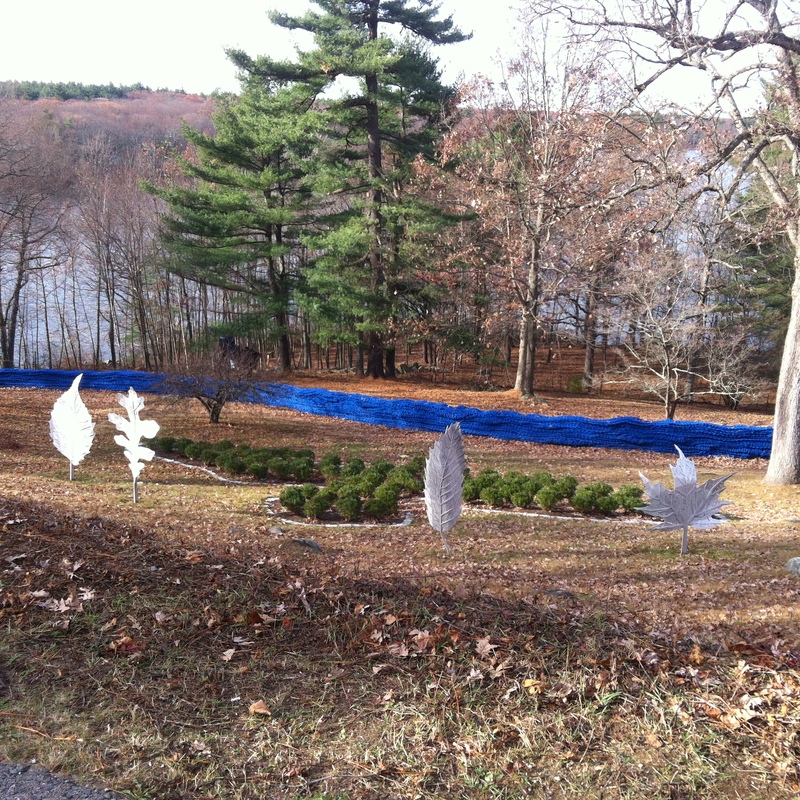 As we followed Genger’s installation up over a hill top, we came upon Endangered Species of New England. As I thought about our day at the deCordova, I was inspired to create functional planters with images of the endangered leaves. 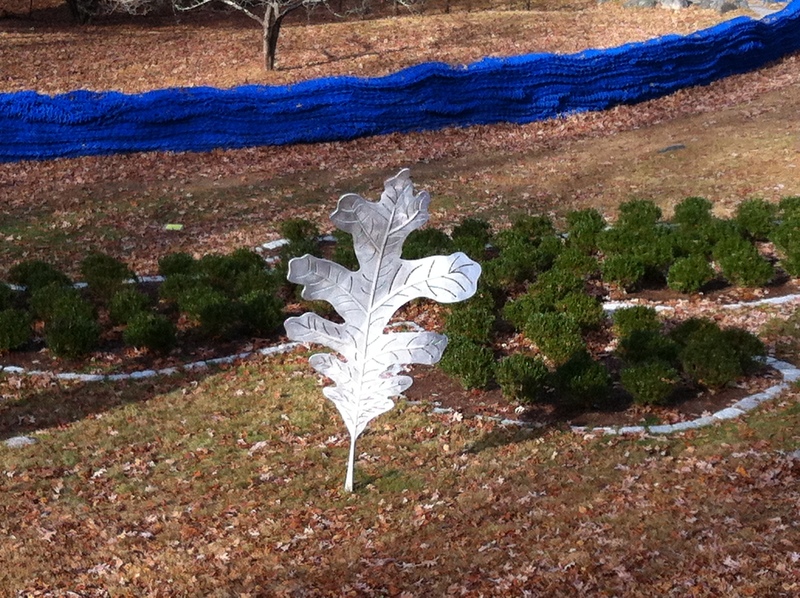 The hand carved leaves turn on each planter like the wind is giving them a push. The trays that the planters sit upon have been pressed with a netting like fabric to symbolize Red, Blue and Yellow. 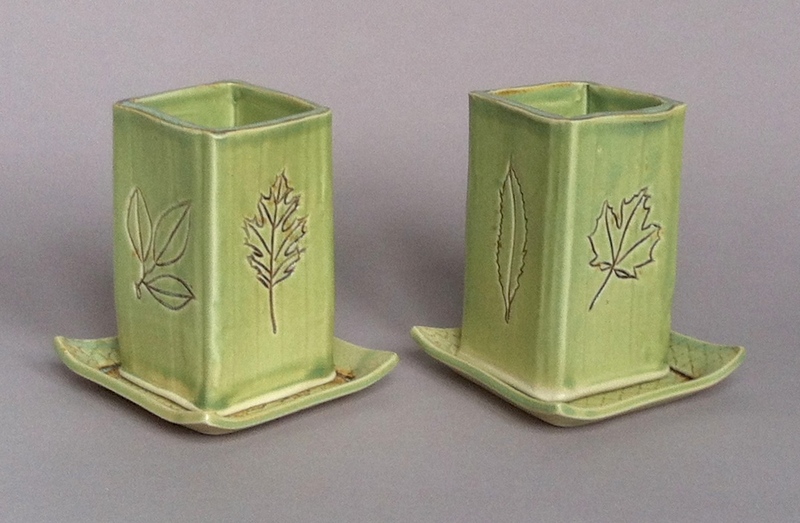 The imagery on the tray embraces the group of leaves providing protection. There is functionality to this work too; each planter has a drainage hole in the base. The tray collects the water and keeps the plant healthy. My spring collection of pottery is inspired by a trip I took with my family to the Turks and Caicos Islands. I took a lot of photos of my surroundings, things that interested me. Like this painting (below) in the lobby of our hotel. When I returned home, I printed out the photos and added them to my sketchbook. Making notes and working through the pictures, I decide how best to tell the story of my trip through a collection of pottery. 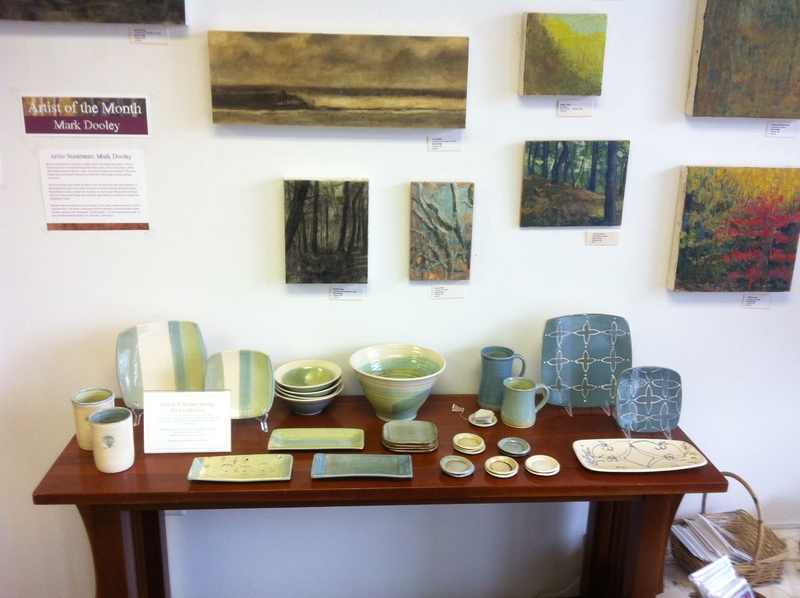 The painting influenced the first pieces that I made – the Turks and Caicos square plates (above). 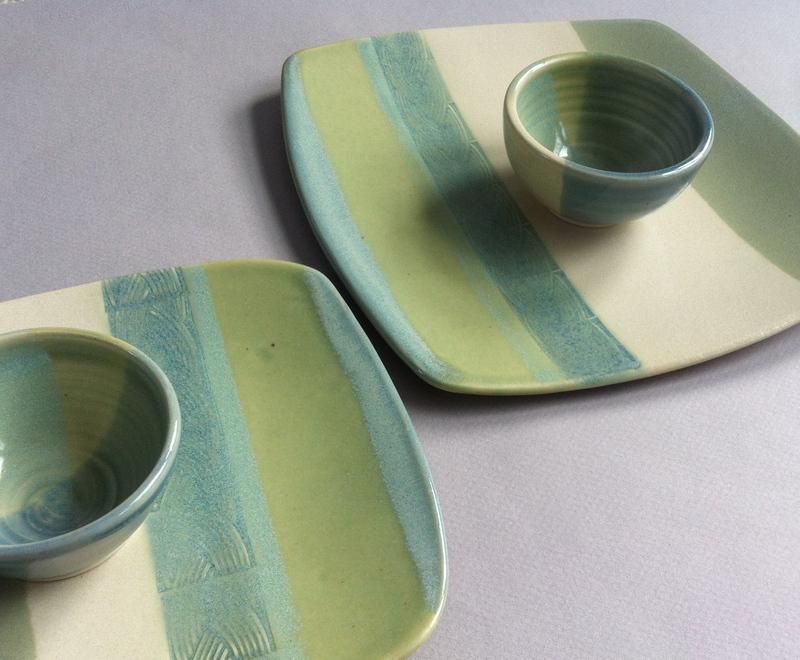 This oblong dish (left) is slip trailed with blue engobe on a white clay. 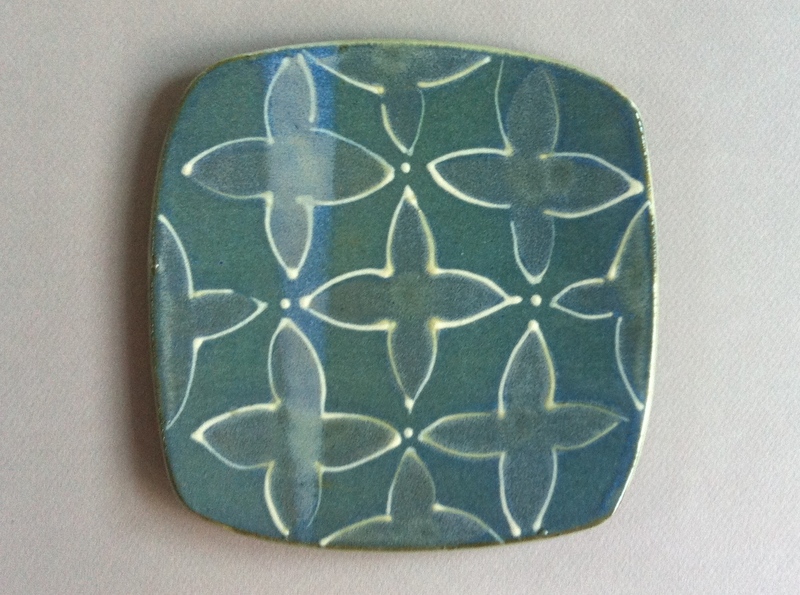 The glaze is a peachy color and changes the blue slip to blue green. 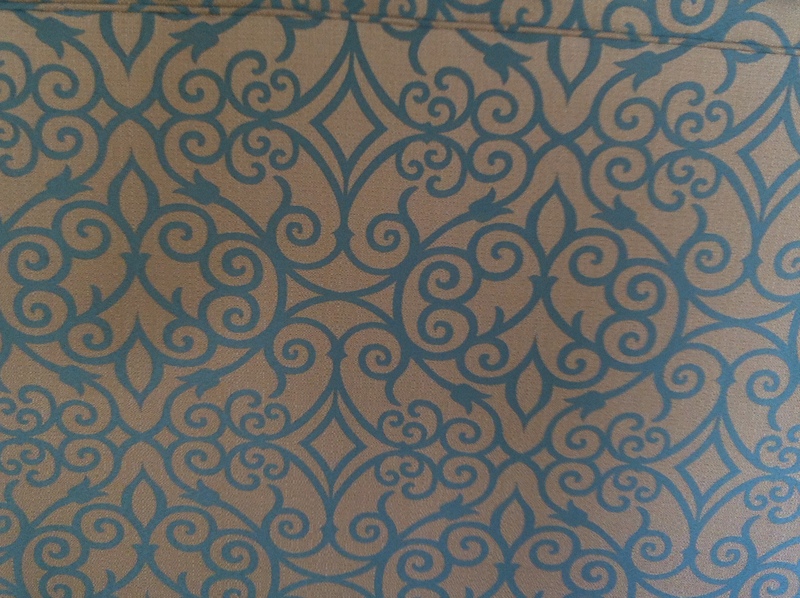 This design was inspired by the fabric upholstered on the two big couches facing each other in the hotel lobby. The couches were comfy and welcoming. Right near these couches was a water cooler filled with lemon slices that I stopped at each time I passed through the lobby. Turks and Caicos is known for their baskets. I purchased a small covered one that is now filled with shells collected on the beach. 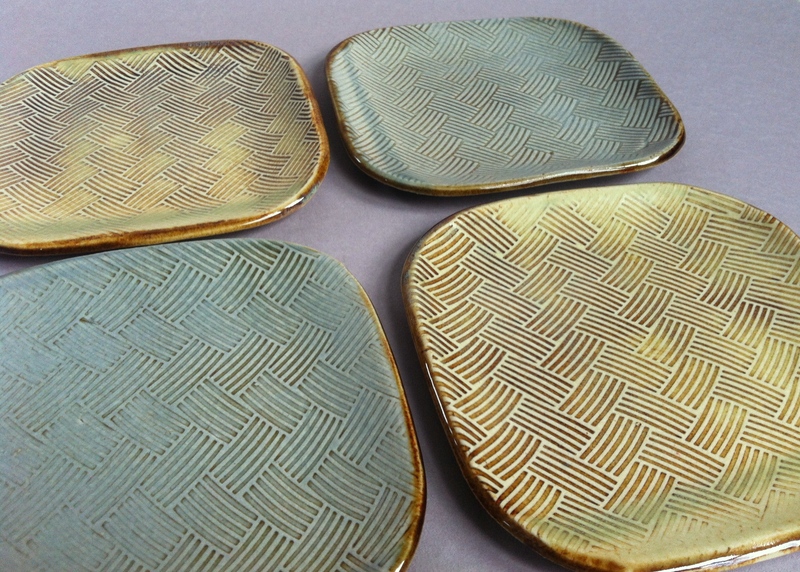 The basket weave was a pattern that I wanted to dominate my collection to give a nod to the local handcraft of basket making so I created square dishes, oblong trays and tea bag dishes all utilizing the pattern. Square plates with a white slip trailed design on blue engobe were inspired by the pattern I found on a vent throughout the resort. It gave me a wonderful repeating pattern to play with. In my sketchbook there are drawings and photo paste ups of the sand and the blue green water. The collection is fun and light just as the trip itself was. I hope I’m lucky enough to go back some day. 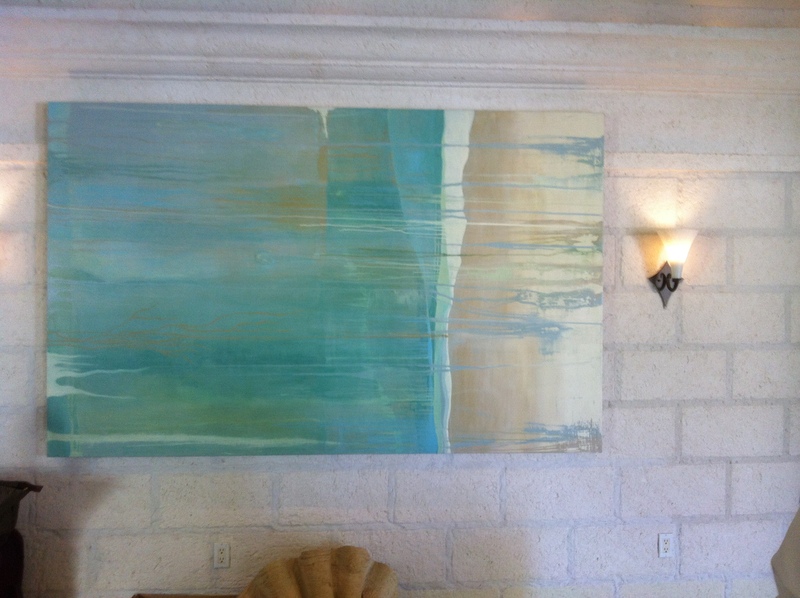 Turks and Caicos Collection is currently for sale at the Dedham Square Artist Guild located at 553 High Street, Dedham, MA. All the work pictured in this blog is available and for sale. “A Table Shared”, the theme for this fall’s Potters Place show and sale, inspired me to think about the conversations we share at our family table based on the answers to “What did you do today?” This round platter(above), oval dish and oblong plate(below) were created after a trip with my husband to the Isabella Stewart Gardner Museum . The courtyard with it’s delicate tile patio, the rooms of dark wood filled with paintings, hand painted tiles, tapestries, prints and letters make up this museum that was built to house Mrs Gardner’s vast art collection. 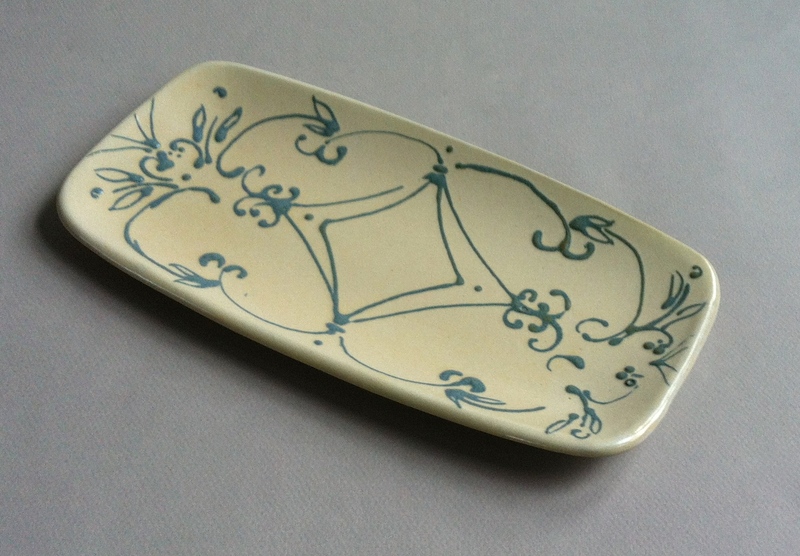 My carved oblong plate has the feel of the interior courtyard, lush with foliage. Frames without paintings remind the visitor that an art theft took place in this building… “On the night of March 18, 1990, a pair of thieves disguised as Boston police officers entered the Isabella Stewart Gardner Museum and roamed the Museum’s galleries, stealing thirteen works of art.” This crime remains unsolved and the artwork lost forever. Detail of exterior decoration that made a lasting impression and influenced the lyrical carving on this oval dish. 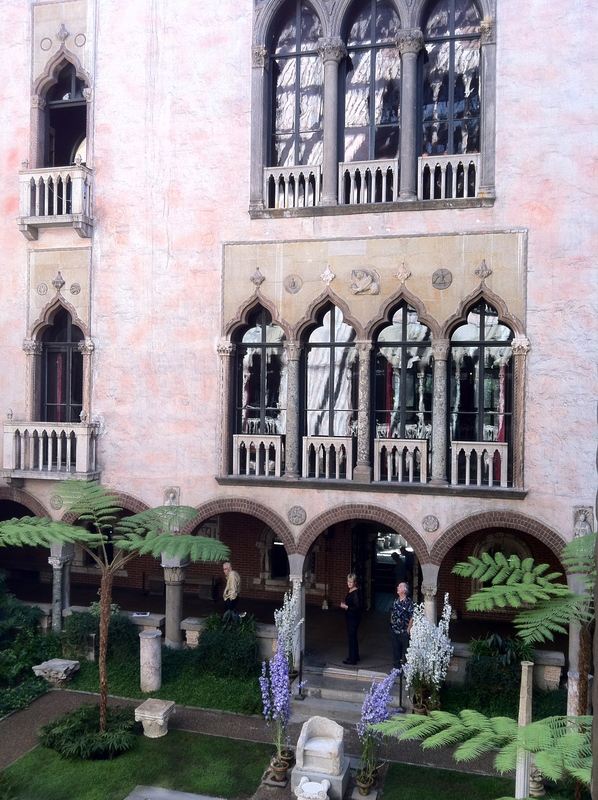 I may return to the Isabella Stewart Gardner Museum soon to view John Singer Sargent’s work again. Mrs Gardner commissioned a portrait and forged a relationship with him as a friend and patron. Just a short walk away is an exhibition of the John Singer Sargent watercolors at the Museum of Fine Arts. The two exhibits are experienced in such a different way. At the Isabella, it is like being in someone’s home where you feel like you get a glimpse inside the life of a great collector. You look at the art as if seeing it through her eyes. That is the conversation that I brought to my family table. The family table is a place where one can share, learn and connect. 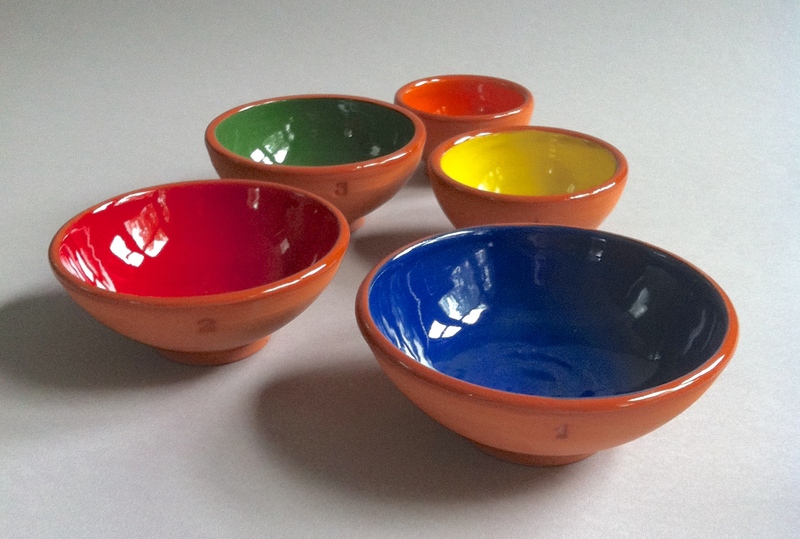 It is also a place where functional pottery brings beauty to everyday life. “A Table Shared”, the theme for this Potters Place show and sale, conjured up the conversations we share at our family table based on the answers to “What did you do today?” This sugar and creamer set was created after a trip with my husband to the Museum of Fine Arts, Boston and a tour of the new American wing. The lidded sugar bowl and hand built spoon. The wheel thrown carved pitcher. This little gem holds about a cup of cream (8oz). Together they make a beautiful set that celebrates the memory of traveling from home and bringing conversation back to the family table to enrich others with the knowledge. The family table is a place where one can share, learn and connect.